SOMETHING FOR THE HOLIDAYS! WHALERABBIT a few hours ago launched a festive series, featuring 4 characters + one bonus. 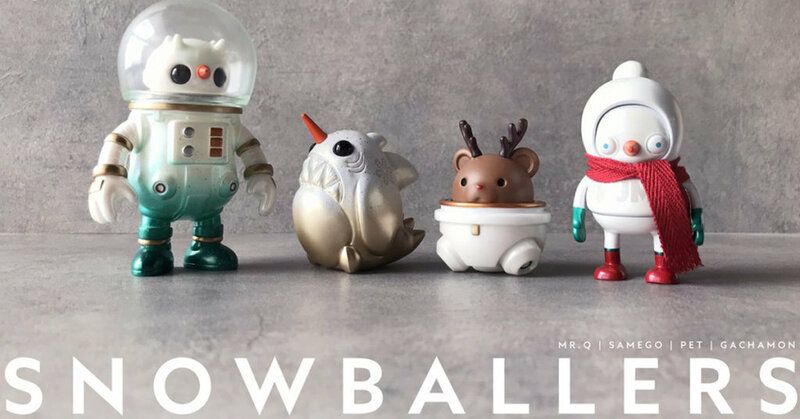 SUPER SNOWBALLER SET includes MR.Q, PET, SAMEGO, GACHAMON and the all-new platform VEE-5 which you can only own if you buy the whole set. Wheres farther Christmas when you need him? Promise we’ve been good, HA. Each individual piece has been Studio hand-painted and a couple have Pearl Effect. How fancy right? You can select individually or own the super set which includes VEE-5. – Price includes registered worldwide shipping.